Filed to: Master race?Filed to: Master race? Perhaps realising it wasn't exactly popular with gamers as a standalone marketplace, Microsoft recently decided to shift Games for Windows over to Xbox.com. That move has now taken place, and...it's gone about as well as you'd expect from Microsoft and PC gaming. 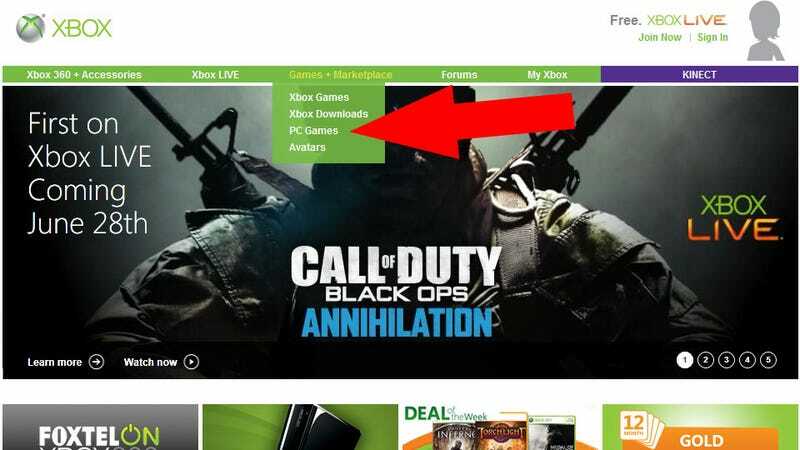 The image above is where you'll find now find PC gaming on Xbox.com. Tucked away in a sub-menu, nestled between avatars and Xbox downloads. Click on it and you'll be taken to the new GFW marketplace. Where one of five featured games is the six year-old Age of Empires III. For all its talk and intent on the subject, some days it really does feel like Microsoft just wants to wash its hands of PC gaming.